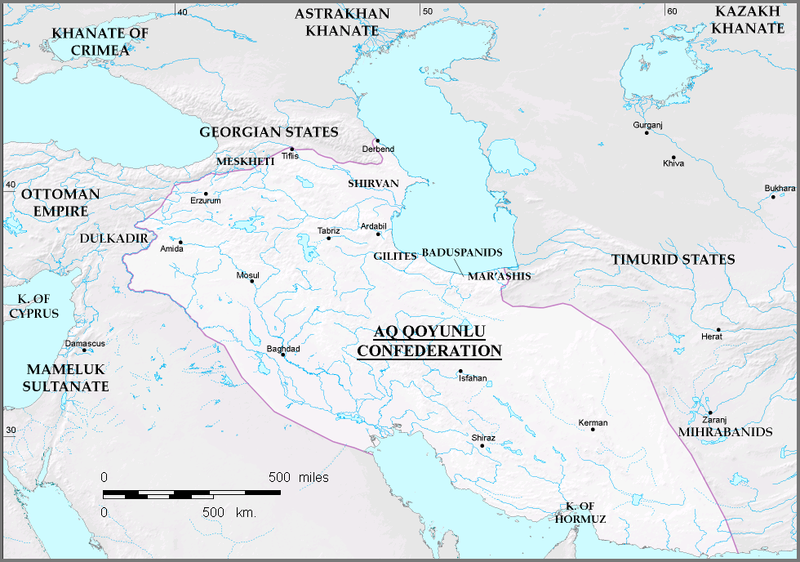 The Aqquyunlu were one of a number of Turkic tribal groupings that emerged in the chaos surrounding the collapse of Mongol authority in the Iran-Iraq region in the mid-14th century. In 1402 the ruling dynasty’s founder, Qara Osman (d. ~1435) threw in with Timur when the latter decided he’d had enough of early Ottoman aggression and invaded Anatolia to do something about it. After the Battle of Ankara, where Timur decisively crushed the Ottomans and sent them into a dynastic tailspin for the next decade, Qara Osman was rewarded with control over the province of Diyarbakr, a region whose historic borders are a little sketchy but that was located in southeastern Anatolia. After Timur died in 1405, the Aqquyunlu undoubtedly would have been interested in expanding their territory, but they were blocked by another Turkic tribal confederation, the Qaraquyunlu (“black sheep”). The Qaraquyunlu had been Timur’s enemies, and after his death they took control of their former home in northwestern Iran (geographically “Azerbaijan,” but don’t confuse the geographic region with the borders of the modern nation), and also (in 1410) conquered Armenia and took control of Baghdad away from the Mongolian Jalayir tribe. As Timur’s descendents proved less and less capable of defending their territory to the east, the Qaraquyunlu kept expanding, until they controlled southern Iraq and some parts of the eastern Arabian peninsula by about 1450. Then they decided to expand into Anatolia, which put the Aqquyunlu in their sights. Expanding into Anatolia turned out to be an exceptionally bad idea for the Qaraquyunlu. In 1452 a grandson of Qara Osman, Uzun Hasan (d. 1478), became ruler of the Aqquyunlu, and he turned out to be a pretty effective military leader. In 1467 the two confederations met in a decisive battle in eastern Anatolia, and, well, you don’t really hear from the Qaraquyunlu again after that. Some of their descendents may have migrated east and founded the Qutb Shahi dynasty in the Indian region of Golkonda (around modern Hyderabad), which survived mostly as a Mughal vassal kingdom until the late 17th century. But they disappear from the Middle East. Uzun Hasan pushed east (at the expense of the Timurids) until his new empire reached the borders you see in that map above, but what he desperately wanted was to defeat our friends the Ottomans. They’d recovered so thoroughly from Timur’s 1402 thrashing that, as we all know, in 1453 they finally closed the book on the Roman/Byzantine Empire for good by conquering Constantinople. This in itself put them on Uzun Hasan’s bad side, because the Aqquyunlu had long had close ties to the Byzantines–Uzun Hasan’s queen consort was a princess of the Byzantine successor “empire” of Trebizond, on the southern shore of the Black Sea. Under Mehmed II, the Ottomans were able to expand well into southeastern Europe and to continue their eastward push through Anatolia, bringing all the Turkish principalities there under (or back under) Ottoman control. They conquered Trebizond in 1461, which you can imagine must have made Uzun Hasan’s wife pretty mad. It was inevitable that the Ottomans would run into the Aqquyunlu in Diyarbakr, and Uzun Hasan wanted to be ready for it. Uzun Hasan’s preparations for the inevitable battle with the Ottomans primarily relied on an alliance with the Ottomans’ primary European enemies, the Venetians. It was actually the Venetians who made the first move here. They were at war with the Ottomans over the Aegean Sea and parts of modern Greece and Albania from 1463-1479, and around 1463 they sent an embassy to Diyarbakr to see if Uzun Hasan would be amenable to attacking the Ottomans from the east, forcing them to fight a two-front war. Uzun Hasan stalled, but ultimately decided that he’d never get a better chance to deal with the Ottoman threat than while they were occupied with a war against the Venetians to the west. So he cut a deal with the Venetians: equip me with enough firearms to stay on the battlefield with the Ottomans, and I’ll give you your two-front war. At the same time he made an alliance with another Turkish dynasty, the Karamanids in southern Anatolia, who were the Ottomans’ only real rival for Anatolian supremacy. Uzun Hasan’s diplomatic moves were intended to strengthen his position for a fight against the Ottomans, but they had the unfortunate downside of alerting Mehmed that the Aqquyunlu were preparing to attack him. So Mehmed assembled an army and marched it east. In 1471 they defeated the Karamanids and knocked them out of the fight. The Aqquyunlu were next, but they’d be a tough opponent once those Venetian firearms got there, which happened…uh, somebody should check with like DHL or something, because that shipment might still be on its way. No, seriously, the Venetians welched on Uzun Hasan, who hopefully learned a valuable lesson about trusting Europeans, and he had to send his mounted archers out against what was one of the most modernized armies in the world at that time. Estimates in the various histories of the period vary, but the Ottomans probably fielded an army just shy of 100,000 men to Uzun Hasan’s roughly 40,000. To his credit, Uzun Hasan tried to make the best of a bad situation, first by harassing the marching Ottoman column on August 4 as it tried to cross the Euphrates–dealing it some considerable losses–and then by taking the high ground around the Ottoman camp and trying to starve them out. But let’s get real: once the Ottomans, who had the most advanced weaponry and were using the most sophisticated military tactics of the period, got over their confusion and engaged the Aqquyunlu in a pitched battle, it was no contest. The Aqquyunlu army was crushed. The Aqquyunlu more or less rode out the storm for a while, mostly because there was no entity that could really challenge them in the east, though their days of expansion were over. Uzun Hasan died in 1478 and was succeeded by his son, Yaqub, who ruled until 1490. Yaqub never thought about going after the Ottomans again, but he did find himself facing a major domestic problem, a nominally-allied Turkic confederation called the Qizilbash that was led by a dynasty of Sufi warlords known as the Safaviyah. After Yaqub died, his sons spent the next decade squabbling over the throne while simultaneously trying to put down this growing Qizilbash problem, but the latter proved too much for them. In 1501, the Qizilbash decisively defeated the Aqquyunlu and installed their leader, Ismail I, as Shah, inaugurating the Safavid Dynasty that would rule Iran for the next two centuries (give or take). Ismail, who was Uzun Hasan’s grandson on his mother’s side, would soon try to take on the Ottomans himself, and it went about as well for him as it had for his grandfather. By the by, the reason why this battle can be referred to by two different names (see the title) has to do with where it was fought. In Turkish, dağ can mean “mountain” and bel can mean “mountain pass.” The battle happened at the foot of a mountain near a pass, so you do the math. Also, if you’re interested in learning more about the Aqquyunlu, the gold standard is The Aqquyunlu: Clan, Confederation, Empire by John E. Woods. It’s a fantastic book, but it’s intended for a scholarly audience. Previous: Previous post: Have you seen this man?